Careful With That Axe, Eugene: Why do I follow Preston North End? Why do I follow Preston North End? Since the early 1970's I have followed Preston North End. I'm not certain of the date or exact year, but I think it was 1974. You see, I had been a Manchester United fan, but they got relegated that year (remember Man City's Denis Law back heel?). Since it wasn't cool to follow ManU anymore I looked around for another team. I had a photo of the 1971 PNE old Third Division Championship winning team, and also was a fan of Alan Kelly (Ireland's goalkeeper at that time). When Bobby Charlton became manager of PNE, I thought this would be a good team to follow - but they got relegated that year. For over 30 years I have been checking their results as they went up and down the divisions. Occasionally I would get to see them on the TV in a cup game, but otherwise never saw then in action. I finally decided to go over to Preston to see the PNE vs. Wolves game on 10th February 2007. My brother Brian bought the tickets and I flew over to John Lennon airport in Liverpool on Ryanair, then got the train to Preston to arrive in plenty of time for the match. 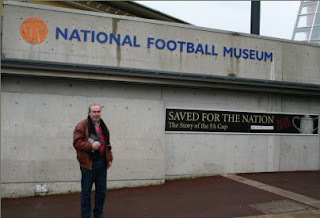 Brian and I went to the Football Museum which was great and then had a beer before the match. 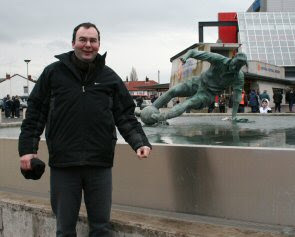 Me at the Tom Finney statue. 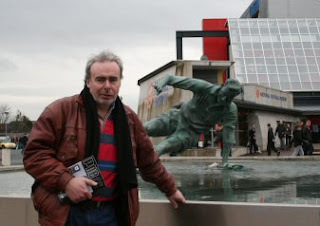 Brian at Tom Finney statue. Unfortunately Wolves spoiled my day by winning 1-0, but I loved the experience anyway. Wolves were much better and PNE's midfield was outplayed. There was a buzz every time David Nugent got the ball, but even he could not get a poor Preston team going. I found it odd that it had taken me over 30 years to finally see a game at Deepdale and I was as excited as a kid heading up to the ground. I bought the PNE jersey to wear proudly back home where people have simply said to me "Preston North End???". I have made a promise to myself to go back to see another game next season - perhaps against one of the bigger teams like Sheffield United or WBA. I'll be watching out for the fixture list with interest. The season ended in disappointment and PNE just missed out on the play-offs - however, having seem them at Deepdale and a lot on TV this year I feel that they would have been certainties to be relegated from the Premiership straight away.